It is good that we remember Nelson Mandela today. His life and time among us holds many lessons for us. 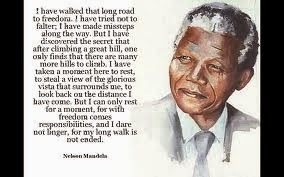 Central to his life was the struggle he lead against the racist apartheid government of South Africa. If you do nothing else today read Mandela's speech from the dock . You can read it here in full. The is a wonderful well crafted speech setting forth the reasons for his actions at the beginning of his trial in 1964. He guaranteed his conviction with it. He may have well doomed himself to death. He begins by taking responsibility for his actions noting that some of which he is accused is true. The rest of the speech is setting forth is argument for breaking the law. The ANC had for decades (founded in 1912) tried to change the political system by trying to participate within it. He pointed out that the State responded with apartheid laws which permanently marginalized black South Africans. The State increasingly enforced these law with more and greater violence. This lead to the necessity to respond with violence. The options were several but the least violent against people, sabotage was the one chosen. Armed struggle remained a possibility. In these days we will hear many heartfelt tributes from individuals and government representatives. There will be some that will ring hollow. We will here from those who did not support the ANC during it's struggle. They in fact supported the apartheid government of South Africa. Some of these countries need to apologize for their part. Of course, they will not. I understand Barack Obama will speak at the funeral and yet the United States government considered Mandela a terrorist until recently. Ronald Reagan called him a terrorist. It was not until only a few short years ago (2005 or 2008) that he was taken off the list. Reagan tried to stop the US from participating in the blockade of trading with South Africa. Congress to it credit over ruled him. I think we should all remember that it was an American CIA agent that informed the South Africa security forces where to find Mandela as he was secretly returning to the country after being "illegally" abroad. How glorious it would be if Obama began his eulogy asking for forgiveness for the United States failure to err of the side of justice. Of course it will not happen, the powerful never feel a need to apologize. The rogue country, Israel, remained a strong supporter of the apartheid government. They even gave nuclear technology to South Africa supposedly to fight against the black socialist hoards. I have been thinking what could be done to really honour Mandela. The greatest honour would be to resolve the Palestinian situation. Israel with the support of the US and much of Europe (and Canada) has developed the apartheid system of resisting any just solution for the Palestinian. It is time for all countries who care about justice to strongly oppose Israel's crimes against the Palestinian people. Another tribute to Mandela could be the release of political prisoners. The United States could begin by closing down the illegal prison of Guantanamo Bay. Perhaps, even the release of the American Taliban, http://en.wikipedia.org/wiki/John_Walker_Lindh and Omar Khadr. 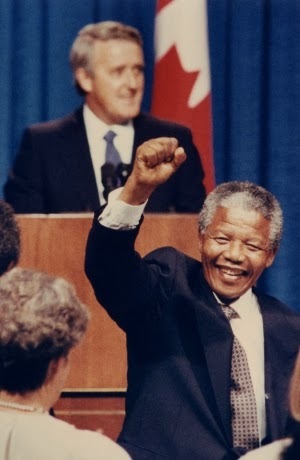 http://en.wikipedia.org/wiki/Omar_Khadr To the extent no such gesture will be made just demonstrate to what extent the lessons from Mandela have not been learned. May we long remember the lessons of Nelson Mandela. The first one is that "terrorist" is not an eternal designation. We should all be careful at who we label a terrorist. Terrorist often turn out to be honoured as freedom fighters and liberators. 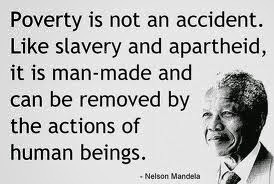 This was the case with Mandela but he also became a great democrat, humanitarian and defender of human rights.